Four HEC Montréal students are leaving today for Spain, at the invitation of the University of Navarre in Pamplona, to take part in a case competition on entrepreneurship, to be held from May 6 to 10. The School’s team consists of four final year BBA students in different specializations: Philippe Bleau Prégent, Management, Aissata Lam, Finance and International Business, Gautier Péchadre, Professional Accounting, and Benoit Pratte, Marketing. The HEC Montréal team, the only Canadian institution invited, will be pitted against seven other universities, including Bocconi (Milan), Singapore, Carlos III (Madrid), Pompeu-Fabra (Barcelona) and Navarre (Pamplona). The same case, written in English, will be given to the eight teams, who will have 32 hours to solve it. Then they will each make a presentation to the jury, followed by the semi-finals, the finals and the announcement of the winning team. The School’s participation in the first year of this international competition is not just a great learning experience for the competing undergraduate students; it is also a chance to strengthen the School’s partnership links with the Spanish university. 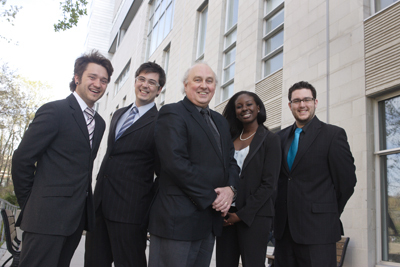 Since 2007, the University of Navarre has been associated with HEC Montréal through the International Exchange Program. In 2008-2009, four HEC Montréal students spent an exchange term in Pamplona, while the School welcomed four students from Pamplona.